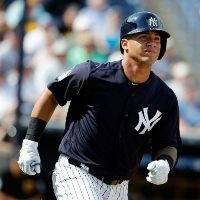 For Yankees second baseman Gleyber Torres this season has had everything: An All-Star first half, a disabled list stint, a slump, and most recently, a scorching resurgence. Torres, like most rookies, had had to adjust constantly to navigate his way through his first season in the majors. After a first half that sent the 21-year-old rookie to the mid-summer classic, Gleyber struggled mightily as he batted a measly .154 over his first 18 games back from the disabled list. Since then it’s been a complete 180 turnaround for Torres. Between August 16 and September 9 Torres was the Yankees’ best hitter. In 23 games the rookie hit .358, with five homers, a .556 slugging percentage and a .438 on-base percentage, all of which led the club in that span. Torres launched his 23rd home run on September 7 and that tied him with teammate Miguel Andujar for the American League rookie lead. The homer was also the 100th hit of his short career, which made him the fourth-youngest Yankee in franchise history to accomplish that feat. He is, in fact, the youngest Yankee since 20-year-old Mickey Mantle to reach 100 hits in a season. The only players to do so at a younger age were Ben Chapman in 1930, Joe DiMaggio in 1936 and Mantle in 1952. Torres energized the Yankee this season as they won their first eight games after his call-up to the majors and he’s is looking to do it once again. After a season of adjustments, he’s peaking at the right time as the team looks to make its push towards the postseason.